Precious metals futures fell Wednesday, Sept. 6, led by palladium and then gold which dropped from a 11-1/2-month high. Losses in gold and silver were their first in four sessions. Gold for December delivery shed $5.50, or 0.4%, to settle at $1,339 an ounce on the Comex division of the New York Mercantile Exchange. 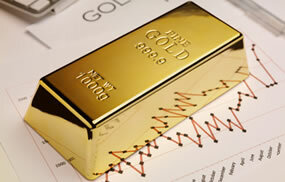 "Gold prices sold off in late U.S. day trade Wednesday, following news the U.S. debt limit will likely be extended. The yellow metal had seen a see-saw trading session up to the unexpected U.S. debt-limit-extension reports," Jim Wyckoff, a senior analyst at Kitco Metals Inc., said in a report. "Still, there are bullish technical and fundamental elements in place that will likely continue to boost the gold market for at least the near term." Gold futures traded from a low of $1,337 to a high of $1,347.70. They climbed 1.1% in their start to the new trading week on Tuesday, posting their strongest close since Sept. 22. Elsewhere, silver for December delivery dipped 3.1 cents, or 0.2%, to close at $17.91 an ounce. Silver futures ranged from $17.89 to $18.07. They gained 0.7% in the previous session and settled at their highest price since April 20. October platinum declined $1.90, or 0.2%, to $1,007.10 an ounce, trading between $1,003.60 and $1,017.50. Palladium for December delivery tumbled $25.10, or 2.6%, to $931.90 an ounce, ranging from $930.15 to $963.95. On Friday, they ended at $977.10 an ounce for their strongest close since February 2001. Gold added $2.30 or 0.2%, to 1,337.85 an ounce. Silver declined 11 cents, or 0.6%, to $17.77 an ounce. United States Mint bullion sales were unchanged Wednesday. Below is a sales breakdown of U.S. bullion products with columns listing the number of coins sold during varying periods. Products with an asterisk (*) are no longer available.